Good news: a new version of Cannon Fodder is in the works! Bad news: if you don't live in Russia, you probably won't get to play it. Codemasters announced today that Cannon Fodder 3, a long-overdue sequel to the classic Amiga games that came out in 1993 and 1994, is in the works at Russian developer GFI. An emerging alliance between European, Asian and African military interests seeks to dominate the world and your job is to stop it at any cost, even if it means feeding thousands of "cannon fodder" soldiers into the battlefield meat grinder. The game will include isometric 3D environments with weather effects, day and night cycles, destructible environments and even a trip into space - but what it may not include is a version for non-Russian gamers. The initial excitement over a new Cannon Fodder was quickly tempered by a statement from Codemasters strongly hinting that the game may never get an English-language release. "In 2008 Codemasters licensed the Cannon Fodder IP to GFI for a one-title project," a Codemasters rep told Eurogamer. "Under the agreement, GFI is designing and developing a new game based on the series for release in Russia and the CIS territories. Codemasters understands that GFI's plans for distribution and release outside of Russia and the CIS have yet to be announced." While the obvious implication of "yet to be announced" is that an announcement could happen, Codemasters doesn't come across as overly enthusiastic about the game or the idea of localizing it for wider release. Even a reasonably successful launch in Russia won't mean much if Codemasters doesn't think it will fly with Western audiences. On the other hand, the accessibility and relatively low cost of platforms like Steam and XBLA mean that anything can happen, so keep your fingers crossed! 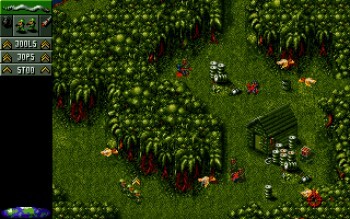 Cannon Fodder 3 is being developed for the PC and Xbox 360, but no release target for any territory has been announced.